Piranhas live in South America and are famous for their menacing teeth. A piranha up close in an aquarium. A piranha is a freshwater fish that is a member of the Characidae family. They are native to South American rivers and are most commonly found in the Amazon River basin and the Guianas. The most common type of piranha is the red-bellied piranha. Piranhas are omnivorous and are well known for their sharp teeth and powerful jaws. They are ferocious predators that attack and kill their prey in schools. 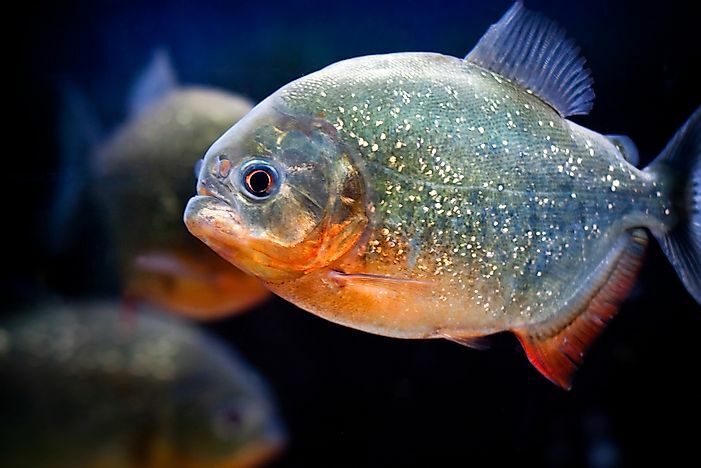 Although they are illegal to be kept as pets in the United States and the Philippines, piranhas can be bought and kept as pets in other countries. Piranhas are a medium size species that range from about 14 to 26 cm long although there have been reports of some identified individuals having a length of up to 43 cm. The body color of piranhas are commonly gray or silver and they have a reddish or orange underside. Their unique dentition differentiates them from other fish. They have sharp teeth on both jaws which align in a single row. Piranhas are omnivorous, but many have been made to think they are carnivorous because they seem to prefer eating other fish. A piranha’s main diet includes insects, carrion, mollusks, plants, fruits, and seeds. They hunt in a school of about 20 individuals commonly hiding under vegetation as they wait for fish to attack. The piranhas ambush their prey (usually fish) by ripping it apart or consuming it whole. In times of famine, piranhas can attack anything that goes into the water including small mammals. There have been rare incidents when piranhas have attacked humans. The Red-bellied Piranha (Pygocentrus nattereri) is a freshwater fish that inhabits rivers and streams in South America. Most piranhas inhabit the Amazon River basin, Guianas, Sao Francisco River, Paraguay-Parana, and the north-eastern Brazilian. Some individuals have been identified in Kaptai Lake in Bangladesh, but the introduction of aquarium piranhas in the United States has been unsuccessful. There have also been some cases of piranhas reported in Lijiang River in China. The total number of the piranha species is unknown but it is estimated that their range could be fewer than 30 to more than 60. There is a misconception that piranhas are very aggressive and can kill anything which has led to many people buying them to help attack animals that enter their tanks. In reality, piranhas are non-aggressive and shy unless they are hunting or protecting their young. They pose a sharp bite that is rare when compared to other bony fish. Piranhas generally stay in schools of 20 and hunt during dawn, late afternoon, and the evening. Their grouping has been thought to be a tactic of cooperative hunting. Piranhas are known to be aggressive during reproduction as the females produce many eggs that the males guard. They are also known to attack more frequently during dry seasons because food is scarce.